Some of the most helpful items I use for sewing are merely scraps of fabric that I use for leaders and enders. Using a leader helps to prevent a needle becoming unthreaded, it also helps to prevent a thread "bird's nest" on the bottom of a project. Personally, I also think it saves thread. 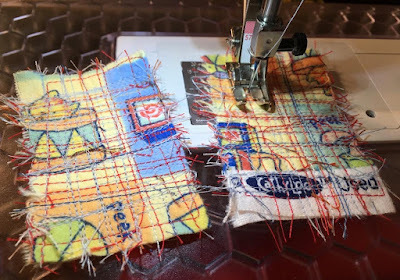 I know that some quilters prefer to sew on "Leader and Ender" projects instead of using a scrap like mine. I tried doing that, but got sidetracked and had to finish the project. I tend to switch-out my presser feet often, so using the scrap ender works best for me. 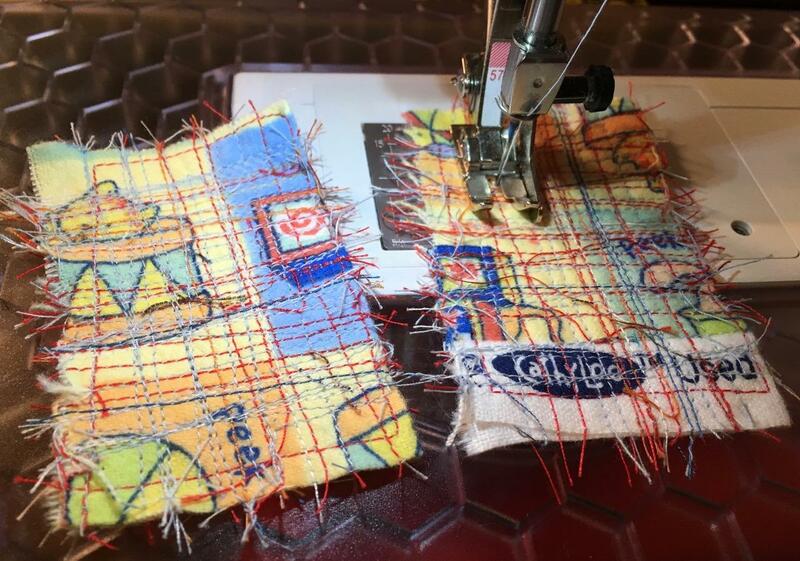 This photo shows a ender/leader being used, which allows chain-piecing. More information on these items can be found here and here. 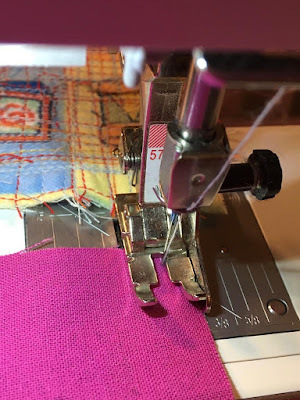 If you sew, do you work on a Leader/Ender project or use a single header/ender scrap? 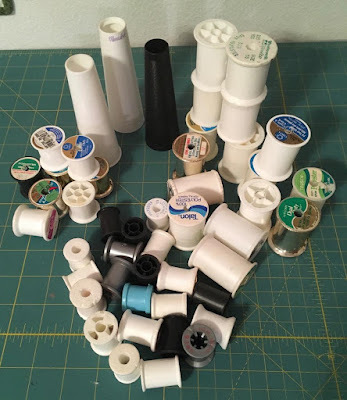 Just for fun, I kept the spools that I emptied in 2017. However, to be fair, some were not full spools, as I often purchase polyester thread in thrift shops and use it for bobbin thread. That said, I managed to use 48 spools of thread in 2017. 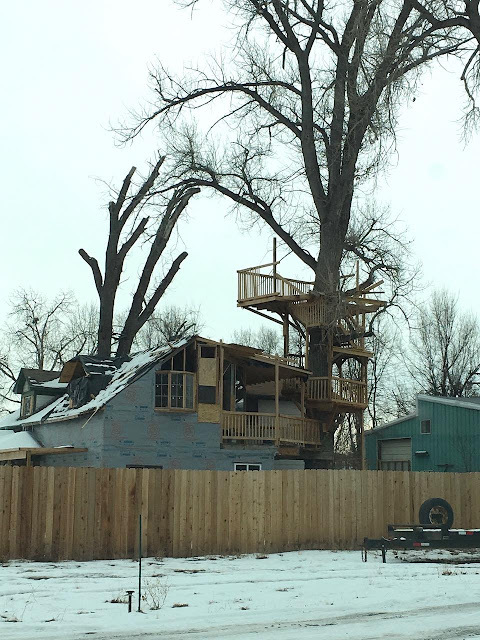 I would love to see the inside of this unique home when the renovation is finished. Doesn't it remind you of the movie, Swiss Family Robinson? 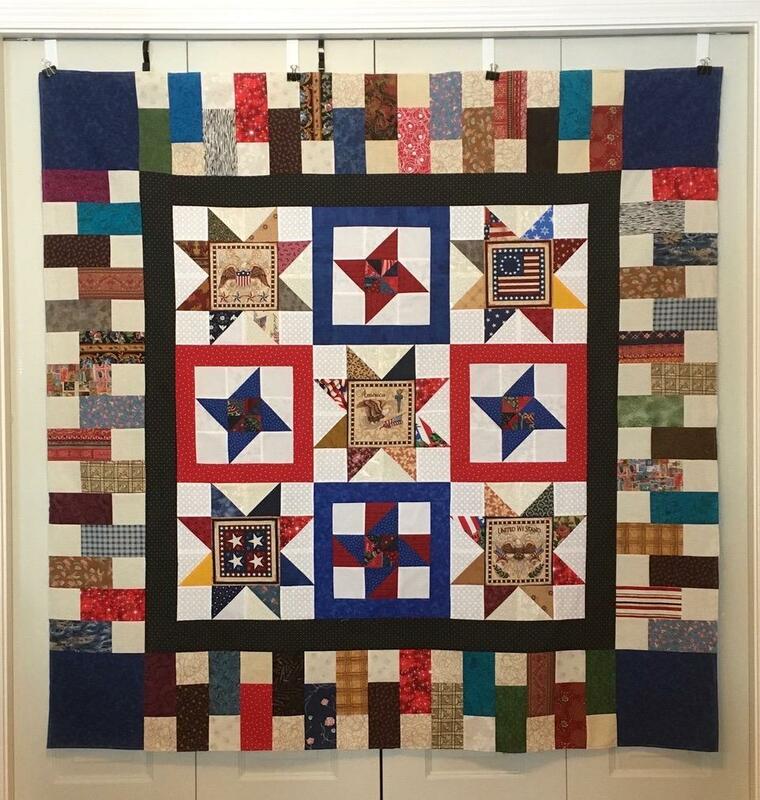 Wrapping Up will be the last Quilt of Valor for 2017, but certainly not the last QOV that I will make. 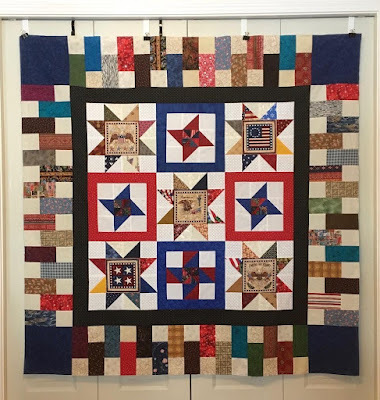 I combined four Sawtooth Stars with four Friendship Star orphan blocks sent by Teresa C. to create this square Quilt of Valor. 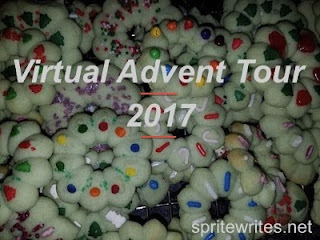 It’s Day 21 of Sprite Write’s Virtual Advent Tour where bloggers from around the world share traditions they enjoy during the holiday season. An Advent wreath sits in the center of my kitchen table from the end of November through the Epiphany which is Saturday, January 6, 2018. The candles on the wreath symbolize the four weeks before Christmas - a time of preparation and anticipation. 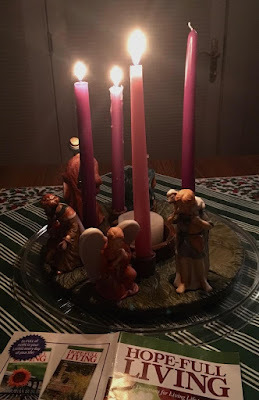 The first week of Advent, I read my morning devotion in the light of one candle. Now (the third week of Advent), my table is aglow with three candles. The third candle is pink (symbolizing "Joy" ), and the other candles are purple or blue. In the center of the wreath is a white pillar candle that will be lit on Christmas day. 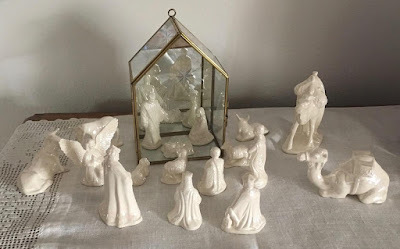 I add the figurines when I first light that week's candle. You can see that the base to the right of the shepherd is missing the figurines of the Holy family. 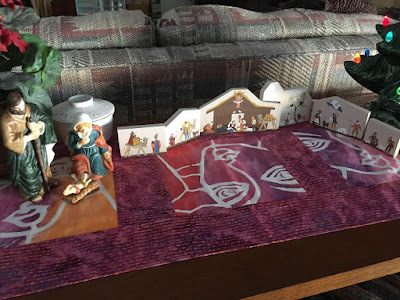 The Holy family figurines are on the display on the sofa table and will be moved to the Advent wreath on Sunday, December 24, 2017, the beginning of the fourth Sunday of Advent. Sometimes, I ponder how the angels appeared to the shepherds in the fields to relay the news of the birth of our Savior. After observing the total solar eclipse this summer and seeing a tiny bit of God's phenomenal power, I can almost put myself there on the hillside when the angels appeared or with the Magi as they followed the star to Bethlehem. 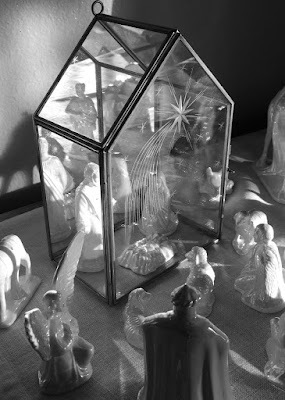 Advent is a time of anticipation and celebration - a time of light and a time of seeking light. In the words of Pastor Anne Roser, "May the candles, the tree lights, the sunrise, the glowing embers of woodstoves and fireplaces, the light of the moon and the stars, streetlights, headlights, and all that reveals and shines out of the darkness remind you of the gift that comes in Jesus Christ, the light of the world. Receive and cherish this light, for it is God’s astonishing gift to you of forgiveness, mercy, and peace." 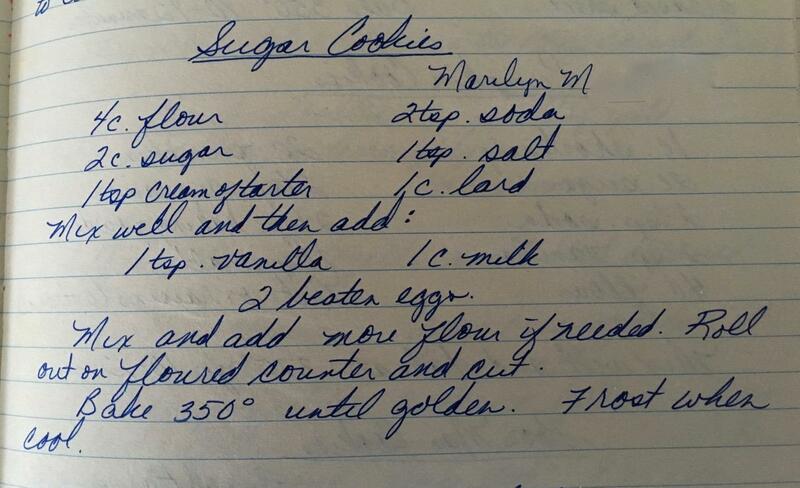 It's time to make a batch of Marilyn's sugar cookies. It makes a big batch, so I plan to use my Valentine and St. Patrick's Day cookie cutters, too. Those cookies will be frozen until it's time to thaw and frost. 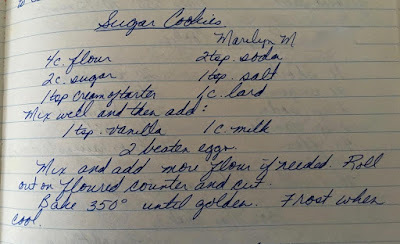 Note: this a a recipe from the early 60s when lard was a common ingredient - just substitute with Crisco. 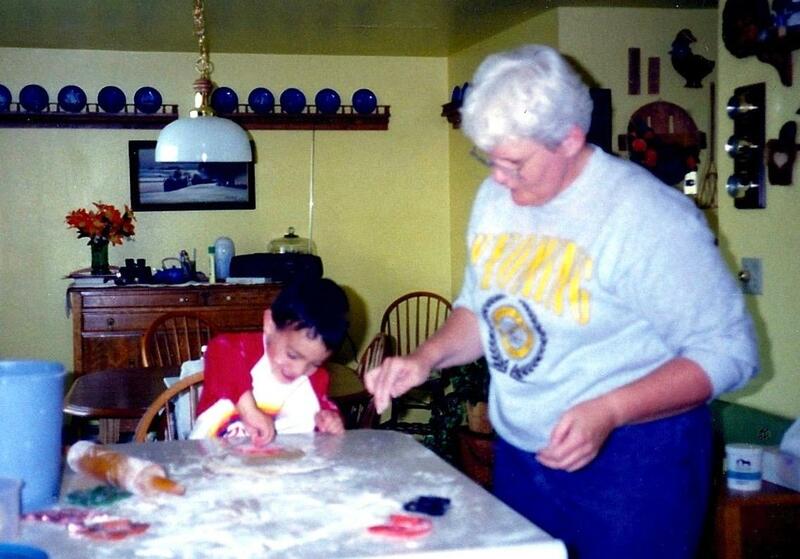 You will have to experiment with your preferred thickness of the rolled dough to result in the perfect sugar cookie. 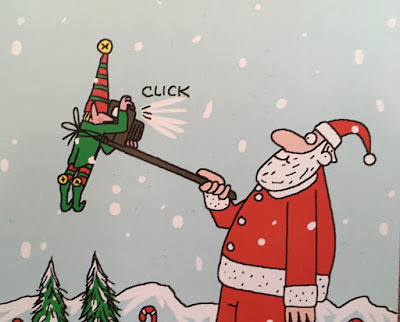 Have you used a Selfie Stick? I'm trying to use as many of the single skeins from my stash as I can before the end of the year. 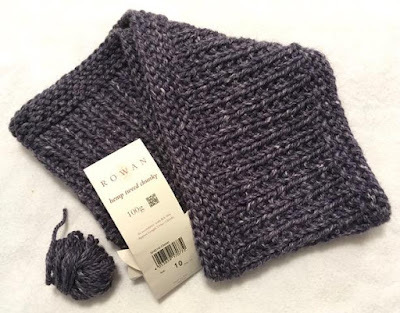 Notes: The pattern's sample used 71 yards (50 grams) of Aran weight yarn on size 9 needles, but the pattern does not indicate the size (width or circumference) of the cowl. Because I was using a chunky weight yarn, I went up to a size 10 needle: the resulting cowl is 5" deep and 22" in circumference. I had 5 grams of yarn remaining. 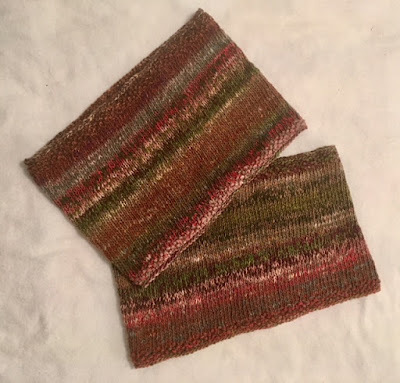 Because of its size, this pattern is more of a neck warmer than a cowl. It’s Day 16 of Sprite Write’s Virtual Advent Tour where bloggers from around the world share traditions they enjoy during the holiday season. 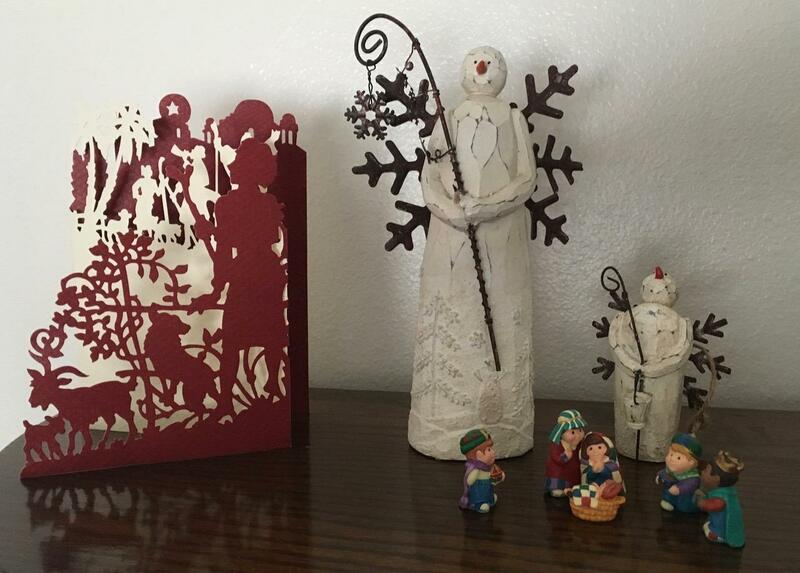 Holidays bring families together for an extended period of time. Many travel hundreds of miles in order to enjoy the company of relatives they don't see very often. The kitchen table is a good place to visit, to eat, and to play games. Whenever my family gathers for the holidays, we enjoy playing games. Sometimes, it's Mexican Train, a domino game, which can last several hours; card games like Nerts, Thirty-one, or Canasta; board games like Sequence, Apples and Oranges, or Rummikub; or dice games like Farkle, Kismet, Yahtzee, or Liar's Dice. Family, holiday entertainment sometimes extends beyond the house, and we go to a movie or bowling. 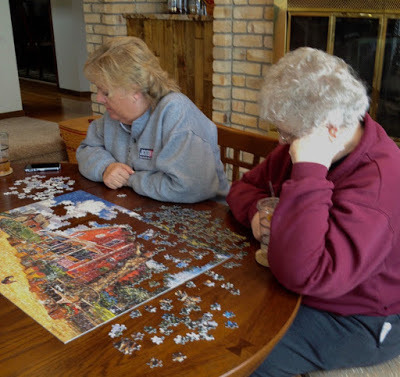 It's also common for family members to work on a jigsaw puzzle. 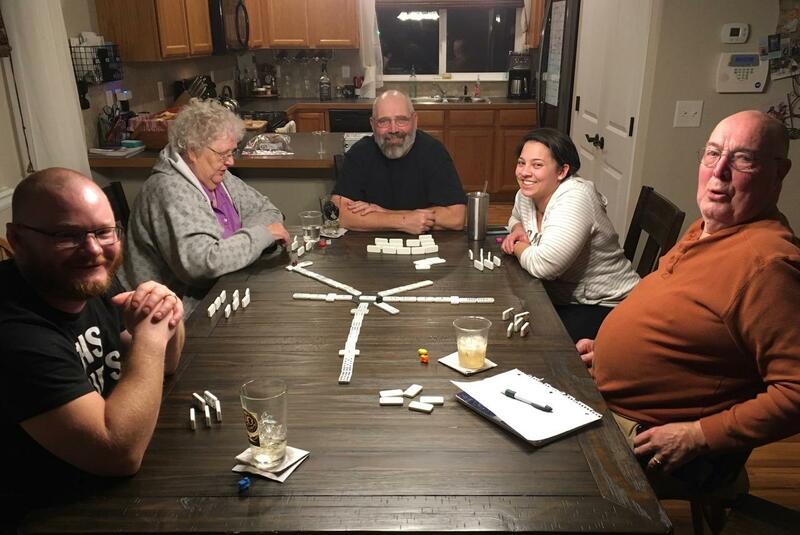 No matter what the game or diversion, my family enjoys spending time together, and holidays provide ample opportunity to enjoy each other's company. The Virtual Advent Tour is sponsored by Sprite Writes. 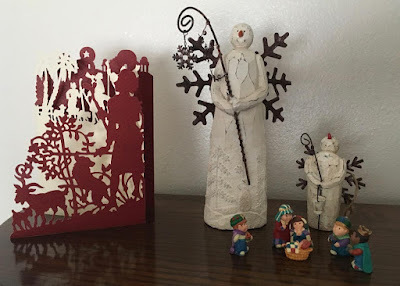 Please visit her site daily to read about Christmas traditions from bloggers around the world. 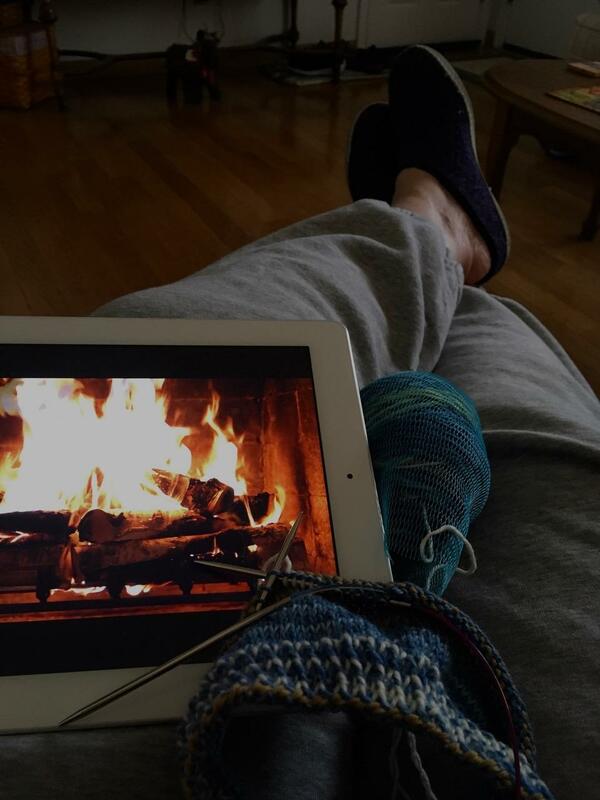 I love the sight and sound of a crackling fire while I knit . . . The Christmas decoration box holds items that can evoke vivid memories. 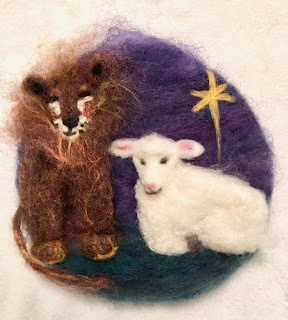 This circular, needle-felted decoration was given to me by Nancy a little over four years ago and is a treasured memento of our long friendship. Not only did Nancy and I go to elementary, junior high, and high school together, but our classrooms were literally across the hall from each other for 25 years. She was a talented fiber artist and taught community knitting and needle-felting classes. Nancy is the one who taught me how to knit socks on two circular needles. You may remember Nancy's blog, High Plains Footprints. She died in 2016 (tribute here), and only a handful of people knew she was ill, so her death was complete shock. 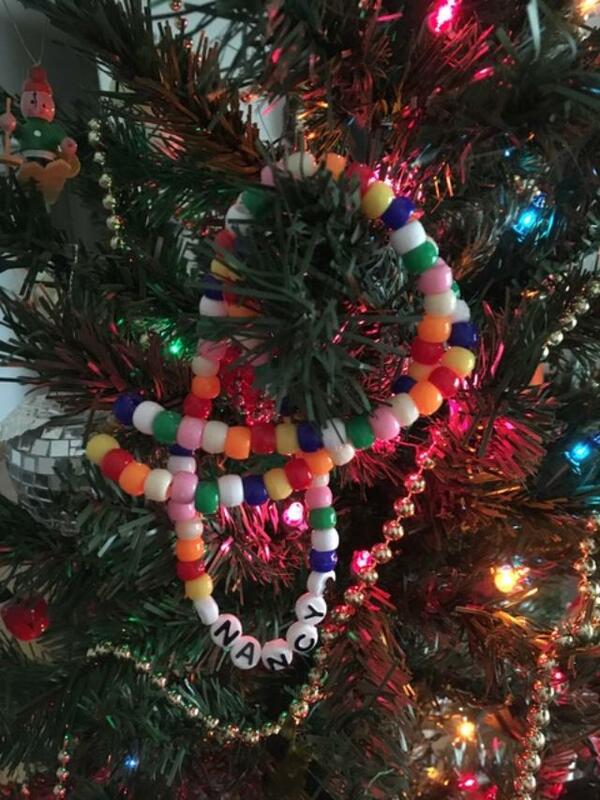 Pulling this item from the box of Christmas decorations was a bittersweet reminder that life is so very short. Please take time this holiday season to connect with friends (old and new) and tell them how much they mean to you because you may not get another chance. The Gingerbread socks will be the last pair to go into my 2017 sock box. The yarn in the skein was deceptive, as I had no indication that they would stripe or that they had this much color. 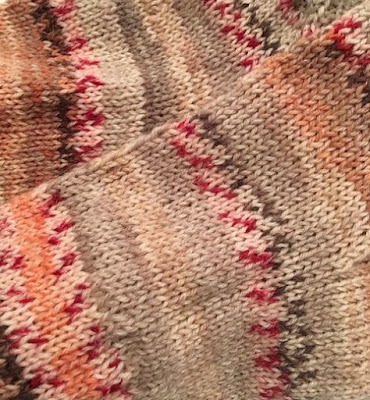 I made no attempt to knit a matching pair. 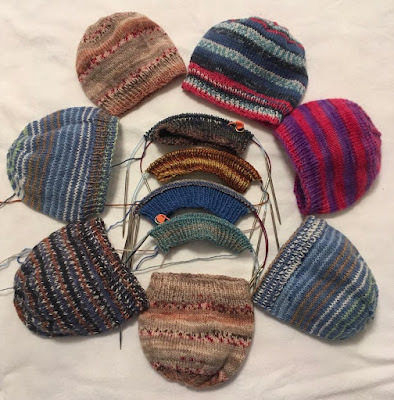 I've knit a LOT of socks, but I still marvel at the construction of the heel turn and the gusset with every single pair. If you knit socks, what is your favorite or least favorite part of the construction? My love for jigsaw puzzles started at an early age. Every winter, my Mom pulled out the card table and placed it in front of the drafty door in the living room. Covering the table were puzzles with colorful images from around the world. 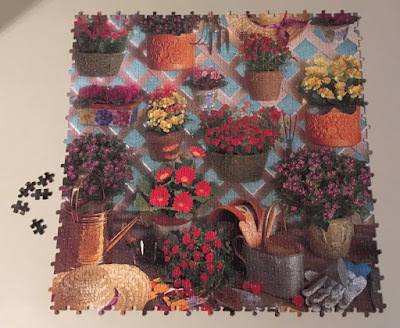 Sometimes, the puzzles had been assembled one, two, or three years earlier: some had pieces missing, but we still enjoyed working on them. Winter and puzzles go well together. 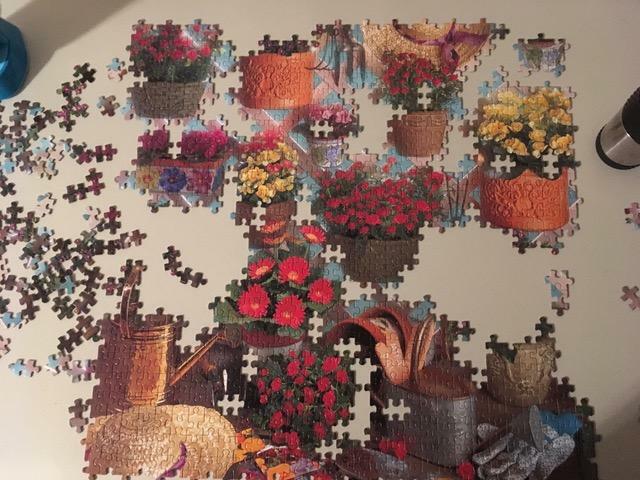 I enjoy the challenge of puzzles, especially ones that purposefully provide a twist. Impossibles are puzzles that have no edge pieces, and they also include five extra puzzle pieces. Usually, I begin a puzzle by turning all the pieces face up and separate the straight-edged pieces to build the frame. With Impossibles by Bepuzzled, my strategy has to change, and I begin with color and build from there. Luckily the photo on the box of Roses Are Red . . . matched the puzzle (often times with Impossibles it doesn't) Roses are Red . . is the third Impossible that I've tackled. A 2010 post, Is It Possible?, shows the varying level of difficulties these puzzles provide. Have you ever worked on a Bepuzzled Impossibles puzzle? Last week at the Riverton Senior Center, I stumbled upon a bonanza of sock yarn scraps as well as two full skeins that someone had donated. 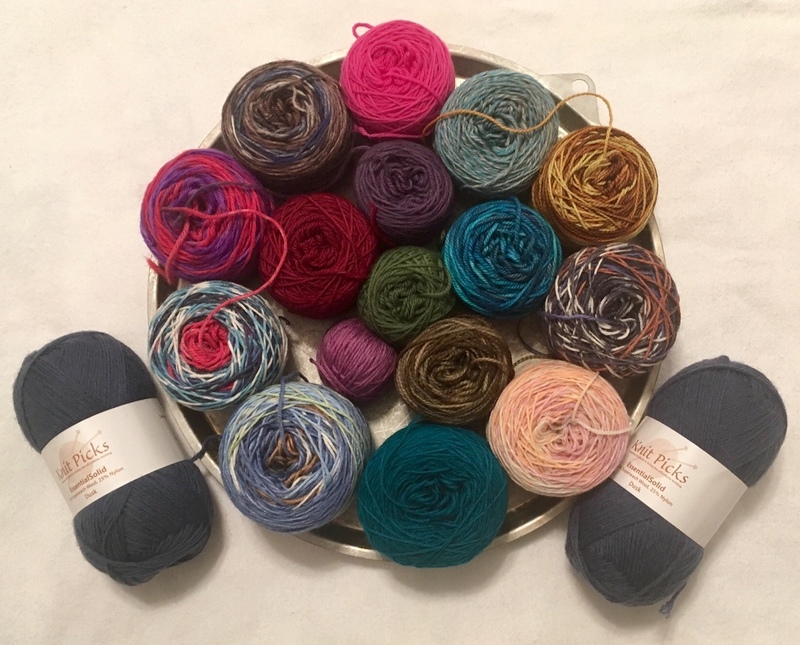 The yarn was available for adoption for a free will donation. I seriously didn't need more yarn, but I plan to knit baby hats with these gorgeous-colored scraps. 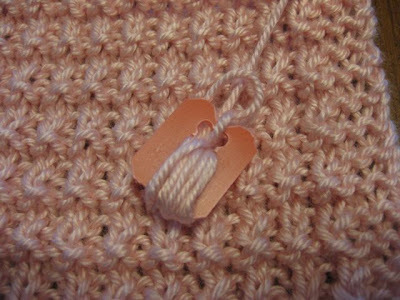 I often use bread tabs for yarn bobbins, especially when I need to have yarn to sew knit pieces together or when simply changing yarn. Most of the bread I buy has twist ties, so my sister saves them for me: thanks, Marilyn. Bread tabs are free and helpful tools. Have you utilized bread tabs in your crafting? On my tree, you will find many non-traditional decorations: a turkey wishbone from 1977, a broken plastic horn from my childhood, and items from my travels. Every decoration has a story to tell. 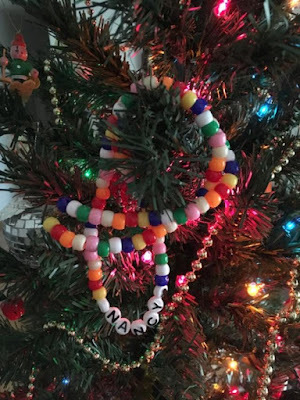 My great-niece (Stephanie who is now 26) made this necklace for me as a Christmas gift many years ago. The beads are strung on wire, so I simply bent it into a shape that could be hung on the tree. Do your "ornaments" have stories/history attached to them? The Gloria Cowl is a good pattern for sock yarn that is not particularly suited for socks. I have a lot of sock yarn, and some of it makes me shake my head and question my judgement, either because of the color, the fiber content, or the way it feels. 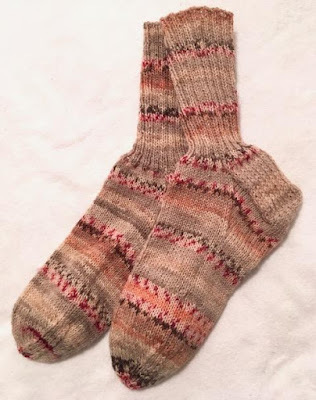 For example, I began knitting socks with the black and purple, and it actually striped vertically which looked really odd. 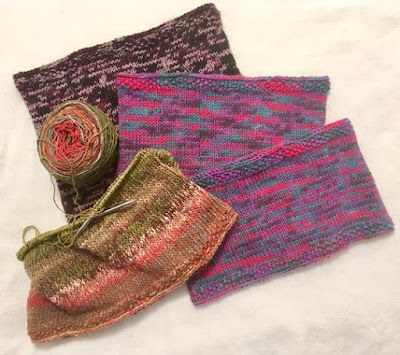 The socks were frogged, and the yarn became a cowl. The Gloria Cowl pattern uses sock yarn and knit double-stranded which creates a nice fabric. Even though it has a seed stitch border (top and bottom) it tends to roll, but light blocking stops the roll. 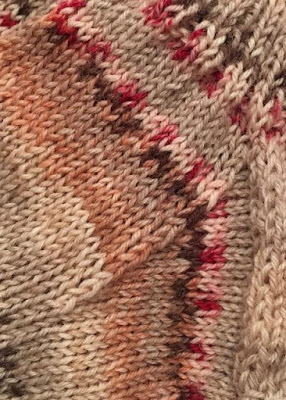 This pattern is definitely a "potato chip" knit - so difficult to stop at one. 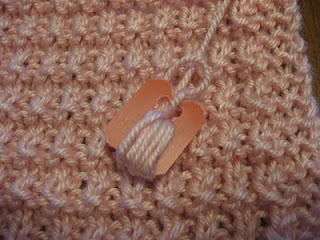 Have you done any "potato chip" knitting or sewing lately?